Red blood cells: Also referred to as erythrocytes, are disk like in shape, and they contain iron laden hemoglobin which is the transport agent for oxygen to the cells and bodily tissues. Blood types: These types are type A, type B, type AB and type O as based on the antigens and antibodies in the blood. Positive blood: Blood is positive when it has the Rh factor and blood. Negative blood: Blood is negative when it does NOT have the Rh factor. White blood cells: Also referred to as leukocytes, are part of the bodily immune system which fights off infections. Platelets: Also referred to as thrombocytes, the platelets are the part of the hematological system that manages coagulation, or clotting, with the prevention of blood loss with bleeding and hemorrhage. Clotting factors: Components of the blood that manage coagulation, or clotting, with the prevention of blood loss with bleeding and hemorrhage, in concert with blood platelets. Bone marrow: Produces red blood cells In the medullary cavity of the bone. Red blood cells, also referred to as erythrocytes, as more fully discussed previously in the section entitled the Circulatory System, are disk like in shape, and they contain iron laden hemoglobin which is the transport agent for oxygen to the cells and bodily tissues. Unlike other cells in the human body, red blood cells do NOT contain a nucleus but they do contain glycoproteins which determine the blood type for individuals. 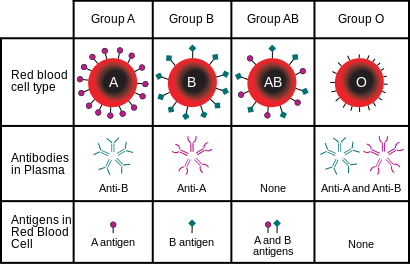 The blood types are type A, type B, type AB and type O.
contains A antigens in the red blood cells and B antibodies in the blood plasma, as shown in the chart above. Type A blood can be donated to blood types A and AB people and people with type A blood can receive types A and O blood. Contains B antigens in the red blood cells and A antibodies in the blood plasma, as shown in the chart above. Type B blood can be donated to blood types B and AB people and people with type B blood can receive types B and O blood. Contains both A and B antigens in the red blood cells and NO antibodies in the blood plasma, as shown in the chart above. Type AB blood can be donated to only blood type AB people and people with type AB blood can get all blood types, that is, they can receive A, B, AB and O blood types. Has NO antigens in the red blood cells and both A and B antibodies in the blood plasma, as shown in the chart above. Blood type O is referred to as "The universal donor and the universal sucker" because all blood types, including A, B, AB and O, can receive type O blood; but the person with blood type O can only receive type O blood. They cannot receive A, B or AB blood. Blood types that are negative can only be given to those with a negative blood and blood types that are positive can only be given to and received by people with a positive blood type. Type A +: Type A + blood can be donated to blood types A + and AB + people and people with type A + blood can receive types A + and O + blood. Type A -: Type A - blood can be donated to blood types A - and AB - people and people with type A - blood can receive types A - and O - blood. Type B +: Type B + blood can be donated to blood types B + and AB + clients and clients with type B + blood can receive types B + and O +. Type B -: Type B - blood can be donated to blood types B - and AB - clients and clients with type B - blood can receive types B - and O -. Type AB +: Type AB + blood can be donated to blood type AB + only and clients with type AB + blood can get all blood types provided that the blood type is positive. Type AB -: Type AB - blood can be donated to blood type AB - only and clients with type AB - blood can get all blood types provided that the blood type is negative. Type O +: Type O + can be donated to all blood types provided they are positive but the person with type O + blood can only receive type O + blood. Type O -: Type O - can be donated to all blood types provided they are negative but the person with type O - blood can only receive type O - blood. The process of coagulation and platelets are also a part of the hematological system. The process of coagulation maintains blood volume stability with the prevention of blood loss with bleeding and hemorrhage. Coagulation, also referred to as clotting, is a complex process that, simply stated, entails the activation of the platelets in the blood, the adhesion of the platelets in the blood and the collection of platelet clusters in the area of the bleeding and the formation of fibrin and then a platelet plug to cease bleeding. In addition to platelets, clotting factors are also needed for the coagulation process. Some of these protein clotting factors include clotting Factors I to Factor XIII, kininogen and prekallikrein. Bone marrow also plays a highly important role in terms of hematological system. The innermost part of the bone, the medullary cavity of the bone, produces and contains red blood cells.